Natural fragrance ingredients are natural aroma raw materials derived from natural sources such as plants, animals, and fruits. Distillation and extraction processes are used for sourcing these ingredients that used for making various cosmetics. These ingredients play a key role in imparting signature fragrances to a wide range of cosmetics they are used in. Currently, natural fragrance ingredients are used for making deodorants, hair oils, perfumes, detergents, essential oils, and soaps amongst others. Natural fragrance ingredients are used in essential oils not just to impart a fragrance but also as an important element of the oil due to their medicinal properties. Several of these extracts used for making essential oils are known for treating skin irritations, stress, pain, insomnia, and several other health problems. According to the research report, the opportunity in the global natural fragrance ingredients market is expected to be worth US$5.3 bn by 2024 as compared to US$3.3 bn in 2015. During the forecast years of 2016 and 2024, the global market is expected to surge at a CAGR of 5.8%. 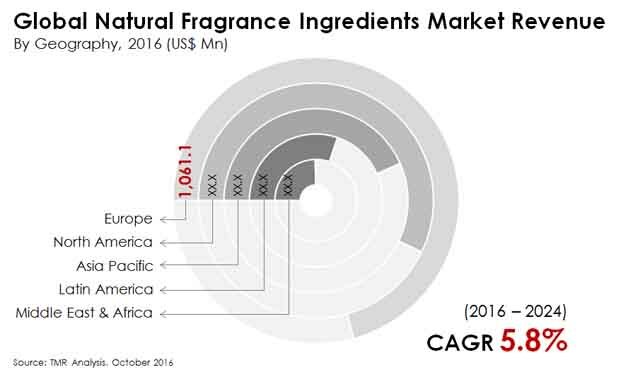 The global natural fragrance ingredients market has gained a significant momentum due to changing pattern of demand. Several consumers and manufacturers are opting for natural ingredients over synthetic ones as the latter are known to contain toxic contents, which can lead to unnecessary effects on the user as well as the environment. The market is also benefitting from the usage of natural fragrance ingredients in several affordable consumer commodities such as soaps, creams, and deodorants. This trend has garnered the attention of several middle-class consumers from emerging economies, which has reflected in soaring revenue over the past couple of years. On the basis of application the global natural fragrance ingredients market is segmented into household care and cosmetics. Presently, the household care segment holds a significant part of the global market due to the growing demand for products such as soaps, hair oils, creams, air fresheners, scented candles, detergents, and car fresheners amongst others. Based on the type of product the market is divided into flower-based, wood-based, musk-based, spice-based, and fruit-based amongst others. Despite the wide range of products, the market is still witnessing a strong demand for synthetic aromas due to the considerable price difference between the two. Analysts predict that demand for natural fragrance is expected to soar in the coming years due to the growing awareness amongst consumers about benefits of using natural products. Furthermore, increasing consciousness about the impact of synthetic products on the human body and the environment is expected to augment the demand for natural fragrance ingredients in the near future. In terms of geography, the global natural fragrance ingredients market is segmented into North America, Asia Pacific, Europe, and Rest of the World. According to the research report, Europe holds a significant position in the global market due to the rising consumption of several consumers that require natural fragrance ingredients. The region is also benefitting from the strong presence of several leading players. The comprehensive analysis indicates that Asia Pacific will witness a rapid growth rate in the coming years due to emerging economies and growing demand for essential commodities pertaining to hygiene. The rising disposable incomes and increasing demand for wellness and other personal care items as well as household care products are expected to fuel the Asia Pacific natural fragrance ingredients market in the near future. Some of the leading players operating in the global natural fragrance ingredients market are Takasago International, Firmenich SA, Givaudan SA, Huabao Intl., Symrise AG, and International Flavors and Fragrances. Natural Fragrance market has been segmented into flower based fragrance ingredients, fruit based, spice based, wood based and musk based fragrance ingredients in terms of product types in the scope of research. Some of the popular flowers used in making essential oils which are in turn used in making fine fragrances are rose, jasmine, violets, lavender, lily, orange flower, moonflower, magnolia, plumeria, chamomile, rosemary, and sweet pea among others. Fruit based fragrance ingredients are used for their fresh and invigorating smell. Mango, Guava, Peaches, Blueberries are some of the fruits which are used to derive fragrance ingredients which are used in perfumes and in various applications. Wood based fragrance ingredients are derived mainly from cedars, pine and fir, balsam, mahogany and sandalwood among others. Amber wood is also used widely especially in making perfumes. Wood based fragrance ingredients form the base of fragrances and therefore are highly demanded. Musk based fragrance ingredients are derived mainly from the Musk Deer which is inhabitant of the Himalayan region. The Musk deer are endangered species and therefore the source of deriving musk based fragrance ingredients have shifted and nowadays it’s been derived from some plants like the Angelica archangelica, among others. Spice based fragrance ingredients includes the involvement of asafetida, cumin, clove, bay leaves, and cardamom among others. In terms of application of natural fragrance ingredients, we have included the household care segment and the cosmetics segment in our scope of research. The household care segment includes products like room fresheners, incense sticks, floor cleaners, detergents Natural based fragrance ingredients are being used increasingly in inducing smell in these products due to their non- toxicity quality. Room fresheners containing flowery smell of natural based fragrance ingredients won’t cause any respiratory problems. Similarly, using detergents made with natural fragrance ingredients won’t cause itchiness to the skin. The cosmetics segment includes beauty benefit products like body soaps, creams, perfumes, essential oil and others. The global natural fragrance ingredients market is majorly driven by increasing importance of using natural fragrance ingredients further supported by rise in disposable income. In addition, the usage of natural fragrance ingredients further increased in cosmetics products due to rise in health concerns among the consumers. . Use of natural fragrance ingredients also protects the environment from harmful chemicals, pesticides and toxins. Advertising and promoting the natural fragrance ingredients products through online retailing has increased their use. Increase in disposable income also allows the purchase of products containing natural fragrance ingredients. The products which use natural fragrance ingredients for inducing odor are usually very costly. This can prevent the growth of this market as the synthetic alternatives are relatively less costly. Also, the use of flowers, fruits and woods can result in the depletion of natural resources which can affect the environment negatively. This report provides the future anticipated market growth of natural fragrance ingredients during the period from 2016 to 2024 along with a current market synopsis. The report also provides in-depth analysis of the natural fragrance ingredients market across various product type and applications. Various economic factors predicted to affect the demand and supply of natural fragrance ingredients across the globe is also highlighted in this report. In addition, the report also sheds light on the detailed industry structures, market share of the leading manufacturers and future predictive demand and supply in terms of revenue in order to provide a detailed analysis of the market. By geography, the global natural fragrance ingredients market has been further classified into North America, Europe, Asia Pacific, Middle East and Africa (MEA) and Latin America. The present market size in terms of revenue (USD Million) along with forecast from 2016 to 2024is also provided in this report. Some of the key players operating in the natural fragrance ingredients market across the globe are, Givaudan SA (Switzerland), Firmenich SA (Switzerland), Symrise AG (Germany), International Flavors and Fragrance (IFF) (U.S.), Sensient Flavors and Fragrances (U.S.) and Takasago International (Japan), among others. The global natural fragrance ingredients market has been segmented as follows.